Here is some information about infra-red treatments for repairing the retina. As you will see from the downloads, this treatment has been shown to benefit patients in a clinical trial of nearly 300 patients. The principle of the treatment is to shine infra-red light on the retina at a specific wavelength that stimulates the mitochondria. These are ‘energy pumps’ that exist inside every cell in the body (including retinal cells), and it has been shown that retinal cells start to degenerate when the mitochondria are sluggish. The infra-red light stimulates them into action. The treatment protocol is two treatments a week, for 4 weeks, and that is what I will be offering. Each treatment lasts a total of about 15 minutes. This is an advertising brochure for the Medlouxx device, but there is a surprising amount of information and some good pictures. This paper has a lot of technical details about the protocol, as he wants to forestall any criticism about his methods. Also, he is at pains to point out that his results have been independently verified. 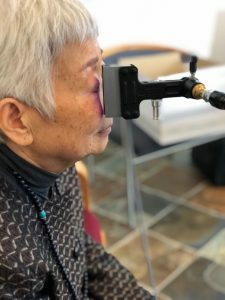 Judging from the sample he chose, the implication is that those who have very nearly lost their sight do not respond well; but provided the patient can see the first line (the big letter) in the eye test chart, there is hope of a significant improvement. He is also at pains to point out that unlike laser radiation, non-coherent radiation is completely safe.